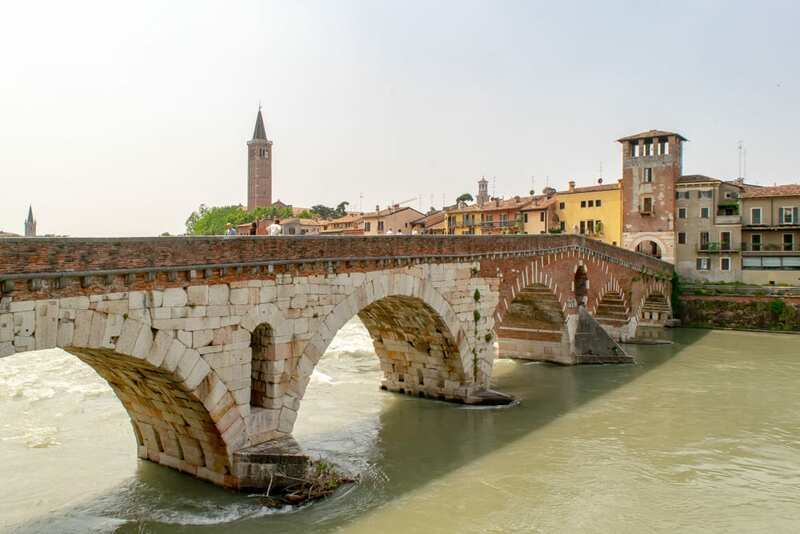 As the home of the most famous pair of star-crossed lovers of all time–not to mention the home of plenty of tasty food, beautiful architecture, and slightly-more-reputable-than-Shakespeare history–there are plenty of fun things to do in Verona. It sounds silly to say, given our Italy obsession, but Verona took us a bit by surprise: often overlooked in favor of its famous neighbors Venice and Milan, Verona deserves more than a passing glance between the more common stops on Italy itineraries. The city is colorful and delightful, and as we worked our way through the best things to do in Verona, one thought kept coming back to us: this is a city that we would love to stay in for a month or more. Looking to discover the charms of Verona for yourself? Go well beyond Romeo and Juliet with this (thorough) list of the best things to do in Verona! How Many Days in Verona? 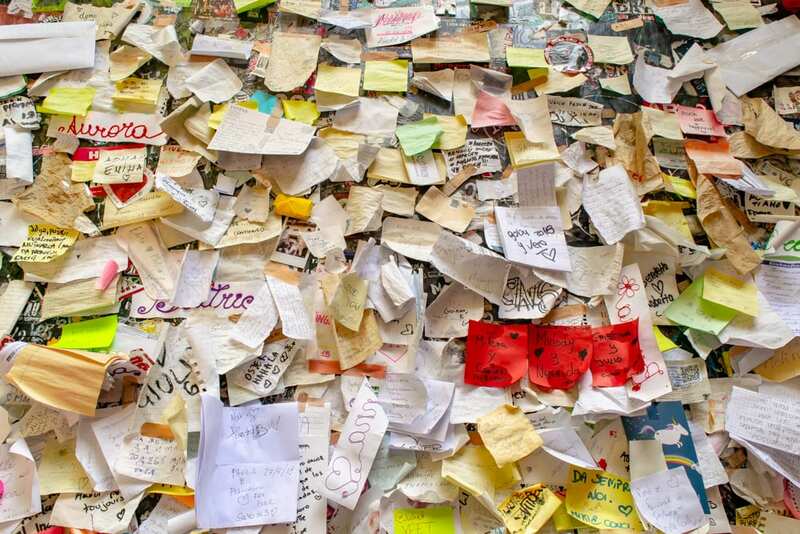 Indulge in some Romeo & Juliet tourism. We might as well start with the obvious. 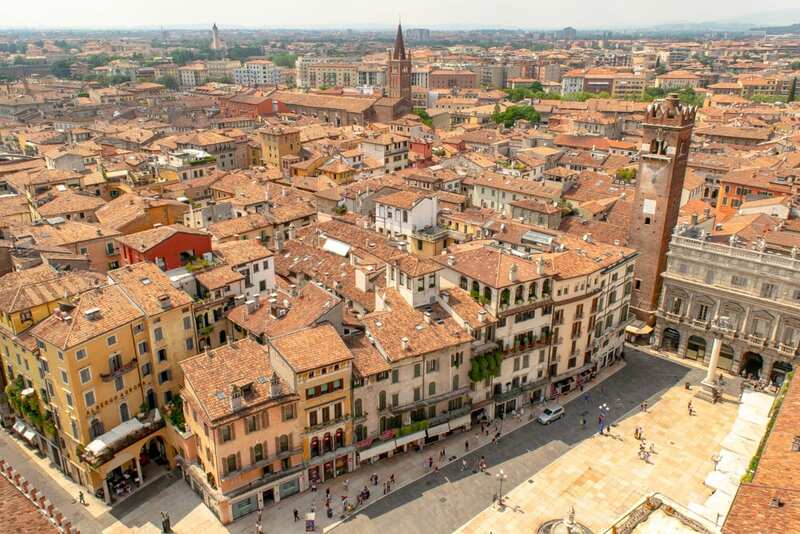 If there’s one thing that Verona is known for, it’s for being the setting of Romeo & Juliet. Though the play is clearly one of Shakespeare’s tragedies (and a pretty depressing one at that), the supposed romance that is central to the plot has taken on a lore all its own–a lore that still lives on in Verona today, through plenty of historical sights said to be locations of the legend as well as Romeo & Juliet themed tours. But, because this is Italy and not literature class, it’s worth mentioning that while Shakespeare’s telling is obviously what propelled the story global icon status, the tale of Romeo e Giulietta predates Shakespeare’s play–in fact, legend has it that there was a true example of star-crossed lovers in Verona in the 13th century. Though the details of their story have mostly been lost to time, writers continued to borrow the legend for poems and stories, and eventually, the legend hit the big time when it caught the eye of William Shakespeare. Looking for Romeo and Juliet inspired things to do in Verona? Here’s where to look. If you’re a lover of all things Shakespeare, consider discovering the history behind the legend with a Romeo & Juliet tour! 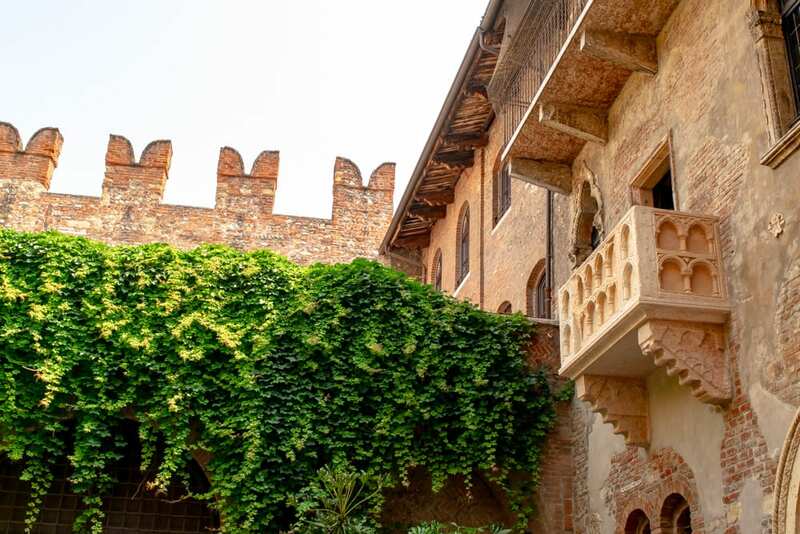 The theoretical home of the Capulet family, usually simply referred to as “Juliet’s house” is the most well-known feature of Romeo & Juliet tourism in Verona. –write and post your very own letter to Juliet. Located in the San Francesco al Corso monastery, Juliet’s (empty) tomb sits in the crypt, where visitors can come and observe where the final moments of Shakespeare’s play are thought to take place. The monastery is now a museum, and if you’re feeling particularly morbid, you can even get married there! Though the home that is thought to belong to the Montague family is now private, Romeo & Juliet fans still flock to the building to admire the home from the outside. As it is just a short walk from the Capulet home, it’s an easy addition when you’re deciding what to do in Verona! If you’re a big Shakespeare fan and simply have to get inside, the ground floor of the home is now a restaurant. While the Basilica Maggiore is beautiful and worth visiting in its own right, today it is best known for its crypt. The crypt is thought to be where Romeo & Juliet got married and is open to visitors hoping to take a peek at the real-life location of the legendary wedding! Make your way through Piazza Bra. As Verona’s largest piazza and the home of its arena, Piazza Bra is an excellent and popular place to start working through the best things to do in Verona. 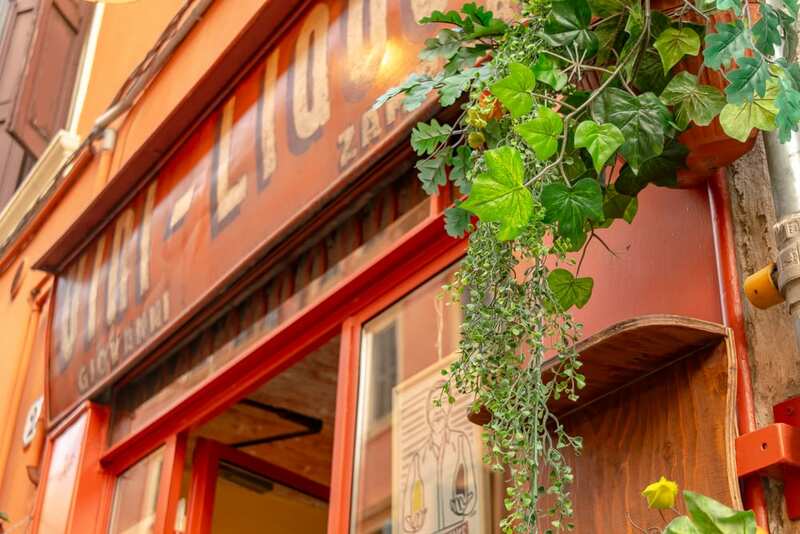 Definitely visit and check out the highlights–but, like with most central piazzas that now serve as tourism centers, it’s best to avoid eating and drinking here, as you’ll likely pay inflated prices for substandard cuisine. Two thousand years is a long time to entertain a city–but the Verona Arena has risen to the challenge. Not only can you tour this arena and admire its long history dating back to the Roman Empire during the day, concerts and plays often fill the arena at night. Today, the arena can still hold a whopping 22,000 visitors, down from its original volume of 30,000. 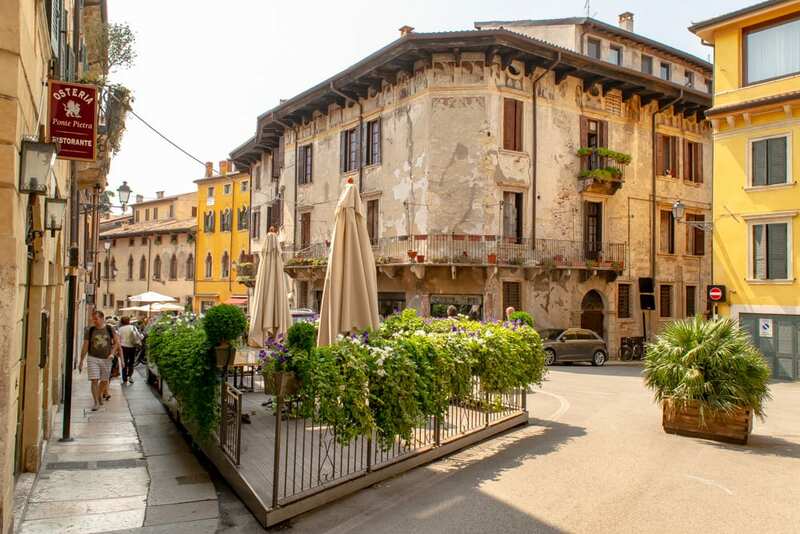 While visiting Piazza Bra, be sure to glance over and pay attention to the Palazzo Barbieri–it is a beautiful 19th-century palace that now serves as Verona’s town hall. This beautiful 14th-century gate sits on the edge of Piazza Bra and is a clear combination of the old and the new: this ancient gate still stands above a road, which these days holds modern cars instead of horses! Stroll across the Ponte Pietra. The oldest bridge in Verona (it dates back to 100 BC!) also ended up being one of my favorite spots in the city, because it was just so beautiful everywhere we looked! Down the Adige River? Gorgeous view. The buildings lining the river, bursting with spring flowers? Gorgeous view. Looking back toward the Castel San Pietro in the hills above the bridge? Also a gorgeous view! And sure, having great weather and visiting during the spring helped, but whenever you visit, don’t miss visiting the Ponte Pietra when you’re in Verona! Soak in the views from the Castel San Pietro. The lawn of the Castel San Pietro is easily the most famous viewpoint in Verona: from here the Adige River, the cities many bridges and towers, and many terracotta rooftops are all visible. We spent far longer than we intended up here, perched on the walls and admiring the view–and if you’re looking for a great place for a picnic in Verona, this is it. If you only have time for a few of the very best things to do in Verona, make sure that a visit to Castel San Pietro is one of them. Before arriving in Verona, it had never occurred to me to go whitewater rafting through a city in Italy. As soon as we arrived and saw the rafts dotting the Adige River, though, I regretted not having time to book a trip. Whitewater rafting through Verona sounds like a fantastic adventure, and it’s at the top of our list of things to do in Verona on our next visit. You can combine rafting & biking with this fun adventure tour in Verona! Check out the Teatro Romano ruins. When walking up to Castel San Pietro, be sure to leave enough time to explore the nearby Roman Theatre ruins! Not to be confused with the Verona Arena, this 2,000-year-old theatre is beautiful and in remarkably good shape for its age. Every city in Italy has its iconic dishes, and in Verona, the best-known among them is risotto. This creamy rice dish is very tasty, and tasting some is an absolute must on your list of things to do in Verona! Piazza Bra may be the biggest square in Verona, but Piazza delle Erbe is arguably just as well known. Often known as Market Square, Piazza delle Erbe is regularly overflowing with market stalls selling everything from touristy trinkets to fruit and is almost always bustling and busy. Whether you drop by when the market is hopping or at a quieter moment when the stalls are shut down and the large space of the piazza stretches out in front of you, be sure to spend a few moments sitting in the shade and watching the city go by in Piazza delle Erbe. Climb the Torre dei Lamberti. Verona’s tallest tower, the Torre dei Lamberti, dominates one side of the Piazza delle Erbe and boasts some stunning views of both the square and of Verona! Originally built in the 12th century (though it was expanded in later years), the Torre dei Lamberti is a fantastic viewpoint, and the climb up is easily one of the best things to do in Verona. If stairs aren’t your thing, there is an elevator you can take up as well–though keep in mind you’ll still have to climb a few flights of stairs from where the elevator drops you off in order to reach the observation deck. Taking a cooking class in Italy is always a treat! In Verona, consider taking a class based around local specialties: think risotto, bigoli pasta, and pandoro cakes. Like anywhere else in Italy, if you add a cooking class to your list of things to do in Verona, you’re sure to walk away with a very full stomach and plenty of fond memories! Wander the streets of Centro Storico. Verona’s historical center is not only the location of most of the best things to do in Verona, it’s a sight worth exploring in its own right. Colorful buildings, beautiful storefronts, gorgeous shutters, and narrow cobblestone streets all greet you in Centro Storico–especially when you step off of the best-known thoroughfares to spend a little time exploring the small back streets of the neighborhood! Relax in the Giusti Gardens. Originally planted in 1580, the Giusti Gardens are said to be one of the most peaceful places in Verona–and one of the prettiest gardens in all of Italy. 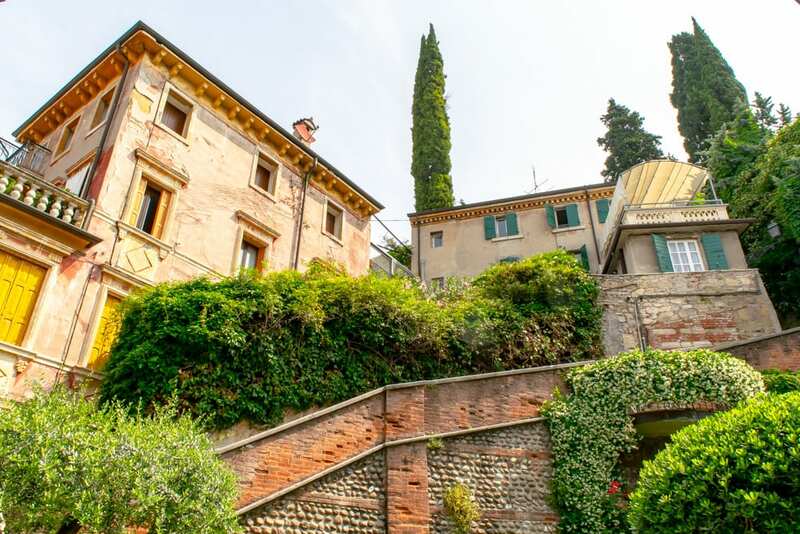 Add the Giusti Gardens to your list of things to do in Verona and spend some time relaxing in the shade, wandering past the flowers, or even to trying your hand at the hedge maze located in the garden. 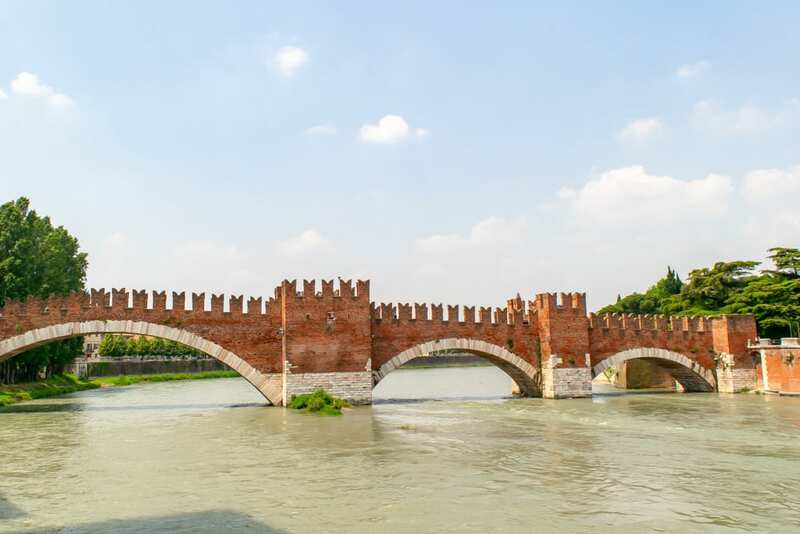 Pay a visit to Castello Vecchio & its bridge. Dating back to the Middle Ages and the time of the Scaliger family, Castello Vecchio is a castle in the most traditional of senses: it was built with defense, not beauty, in mind. Today, a museum holding everything from paintings to bells to weapons is located in the castle. Go see the Arco dei Gavi. 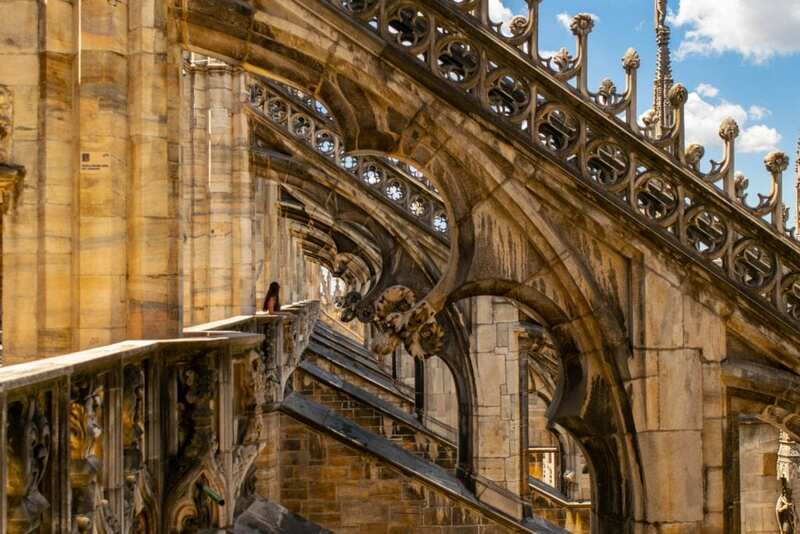 Dating back to the Romans themselves, this arch has had a long and busy life. It first served as the entrance to Via Postumia, which led between Rome and Verona. Later, it had another life in the Middle Ages as a gate to the city, when Verona was walled. 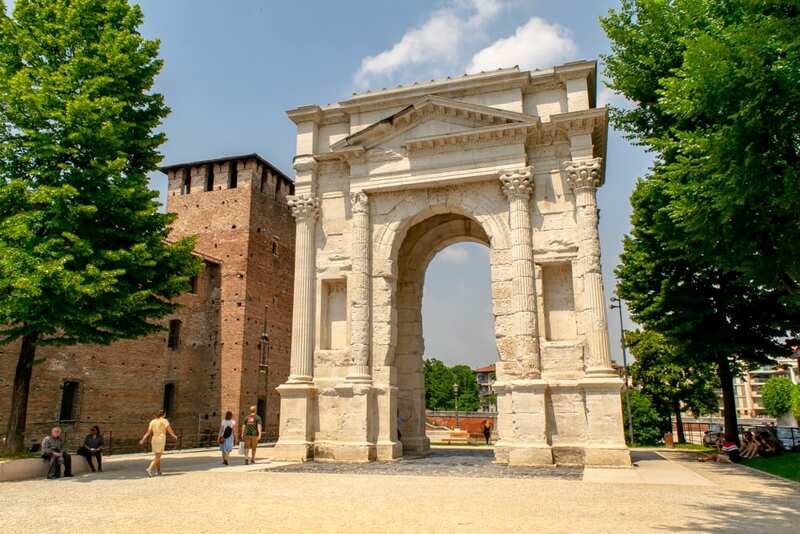 Eventually, the arch was removed to the Arena until the rebuilding that took place in 1932–that rebuilt arch, made with the same stones as the original, can be viewed today next door to Castello Vecchio! Duck into the Verona Cathedral. Boasting a more opulent interior than many Italian cathedrals, the 12th-century Verona Cathedral is definitely worth a step inside. Be sure to look up–the artwork above the altar is absolutely beautiful! Check out the Scaliger tombs. 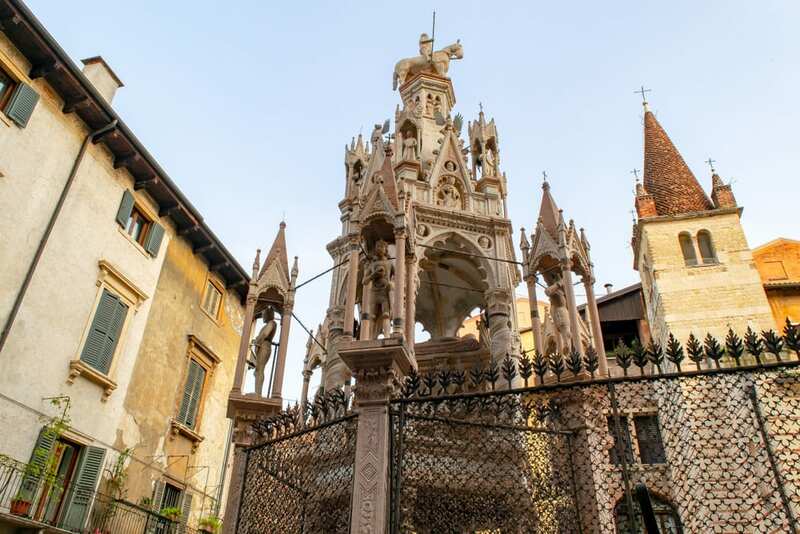 Intricate and eye-catching, the tombs of the Scaliger family are an easy way to add an interesting stop on your list of things to do in Verona. The Scaliger family ruled Verona in the 13th and 14th centuries, and their tombs are one way that they made sure they wouldn’t be forgotten anytime soon. Learn some history at the Piazza dei Signori. 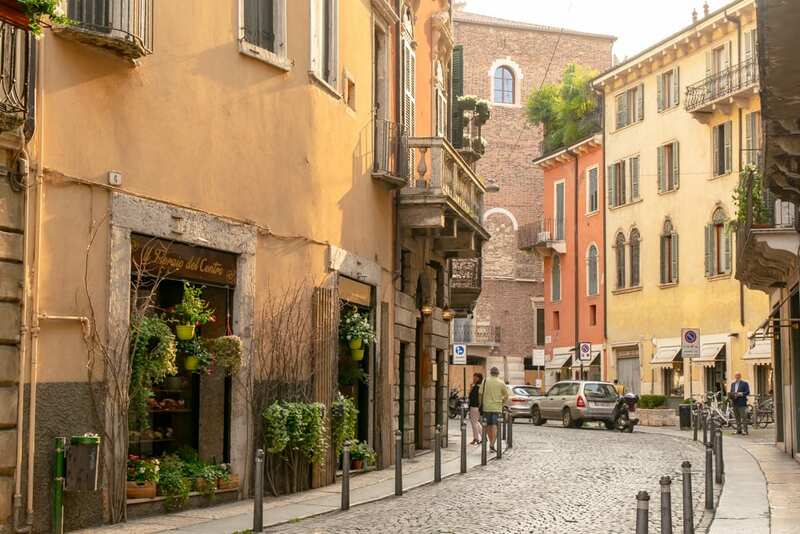 Just a few short steps from the busy Piazza delle Erbe sits the Piazza dei Signori: far quieter than its neighbor, Piazza dei Signori is the perfect place to relax and admire Verona’s beautiful architecture in a quieter setting. Be sure to check out the Dante statue in the middle of the square! Want to see the best of Verona? Consider joining a walking tour of the city! Though Verona is a captivating city, if you have more than a few days in the area, consider taking a day trip outside of Verona, as well! 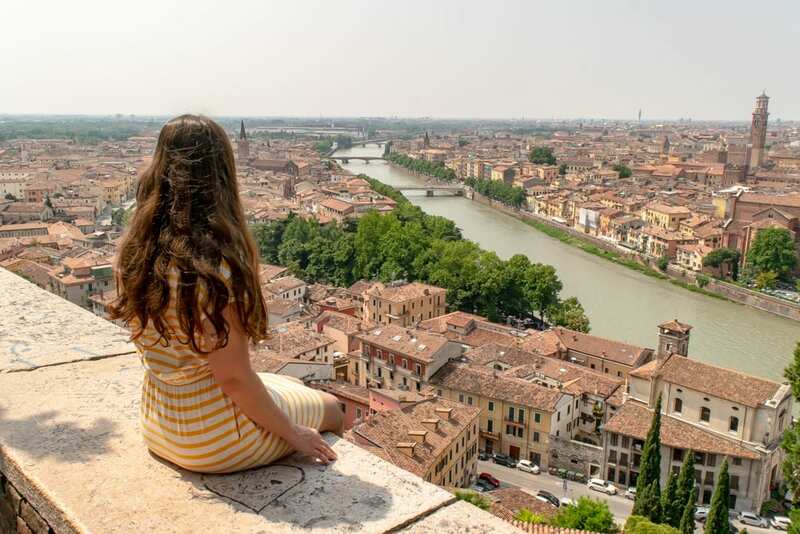 Verona’s convenient location in southern Veneto makes it a great spot to use as a base for day trips–here are some of the best ones to add to your list of the best things to do in Verona. Easily one of the most popular day trips from Verona, Lake Garda is close by, easy to reach, and an utterly delightful escape from city life. Consider taking a stroll through one of the small villages on the lake, hiking to a viewpoint, or even just spending a day relaxing on the beach! Want to get a taste of Venice without committing yourself to the crowds and prices? Consider taking a day trip to Venice from Verona! With one day in the city, you can condense down a typical Venice itinerary and have a wonderful time wandering through the maze of canals and bridges, check out St. Mark’s Square (and bell tower! 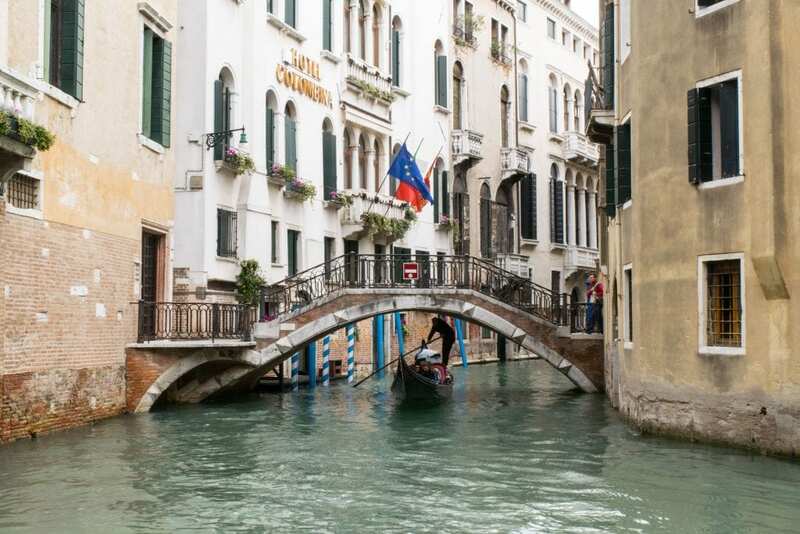 ), and even squeeze in a gondola ride if you deem the steep price worth the bucket list experience. Just east of Lake Garda you can find the rolling hills and delightful vineyards of the Valpolicella Wine Region! Escape the city for the day to enjoy some time at vineyards instead–just be sure to either book a tour or bring along a driver willing to say no to the tasty wine! Book your tour of the Valpolicella Wine Region today! We believe that one day is the absolutely perfect amount of time to dedicate to Milan during an Italy trip–and luckily, it makes an easy day trip from Verona! Admire the stunning rooftop of Milan’s famous Duomo, check out the Castello Sforzesco, and consider paying a visit to Da Vinci’s The Last Supper! An adorable 16th-century chapel built into the side of a cliff: the Madonna della Corona Chapel is one of those places you simply have to see to believe, and it certainly makes for a unique day trip from Verona! Despite the relatively short distance, you’ll likely need a car to take a day trip to Bologna from Verona–but it is worth the drive. As Italy’s foodie capital (as well as the capital of the Emilia Romagna region), Bologna is a place to come to eat! 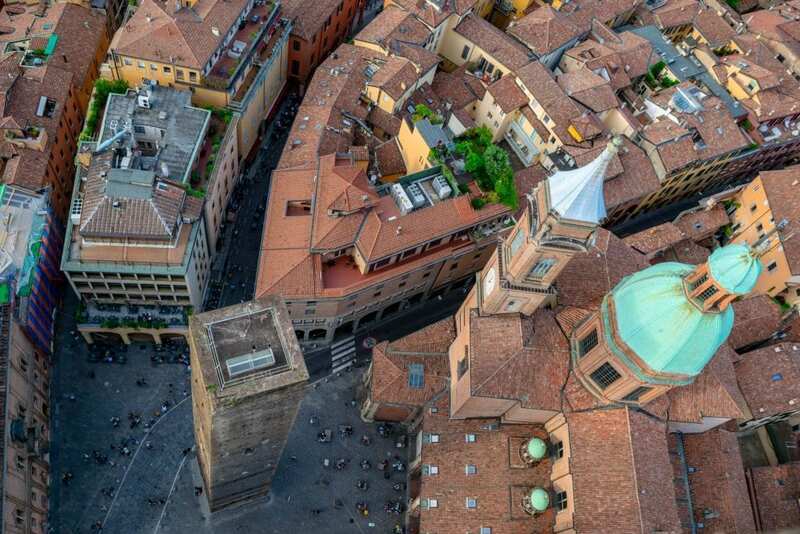 One day in Bologna is best spent eating everything in sight (a food tour is highly recommended), and then spending your remaining time burning off the excess calories by climbing up gorgeous viewpoints like the Asinelli Tower. If you have some extra time on your hands in Bologna, also consider going on a walk to find the hidden medieval canals of the city–you have to know where to look, but they are beautiful once you find them! 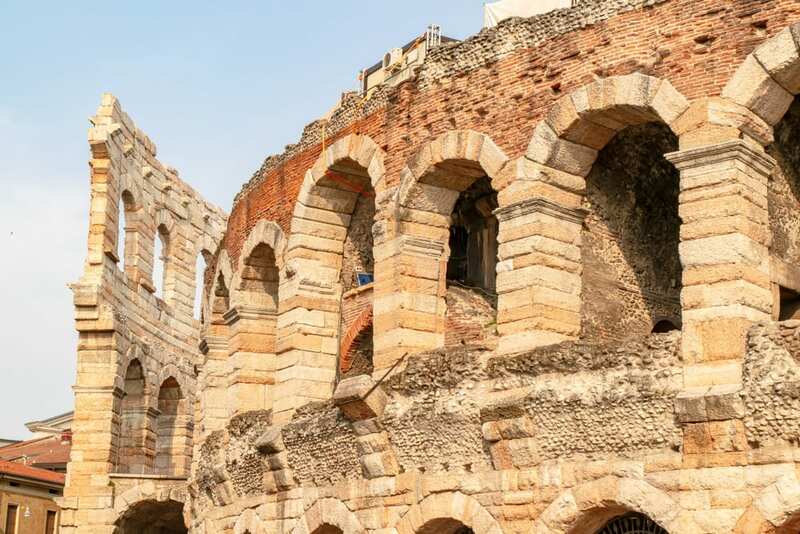 The Verona Card is very inexpensive compared to many city cards and comes with the benefits of skip-the-line tickets for most major sights like the Verona Arena, Castelvecchio, and Torre dei Lamberti, as well as access to Verona’s city bus system. If you’re planning on hitting most of the major things to do in Verona, definitely consider purchasing the Verona Card to save time and money during your trip! Check prices & buy the Verona Card today! Centro Storico and the neighborhoods surrounding it are fairly walkable, though we did find that attractions were further apart than in extremely compact Italian cities like Florence, Venice, and Bologna. We walked everywhere in Verona, with the exception of taking the city bus to the train station when we arrived in and left the city. However, if you prefer not to walk long distances or book a hotel more than a short walk outside of the Centro Storico, you may end up using the bus system more. You’ll also likely be heading to the train station if you take any day trips out of Verona (many regional buses leave from there as well). You can purchase tickets onboard the city buses, however, you’ll pay a premium as opposed to purchasing tickets in advance–so try to get your hands on some tickets before your journey. If you choose to purchase a Verona Card, rides on the city bus are included for the duration of the card’s validity. 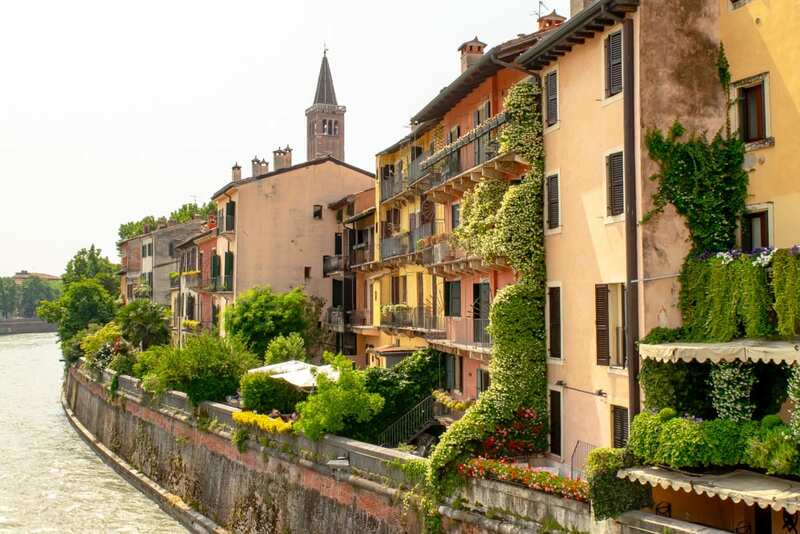 Verona is a beautiful and laid-back city that lends itself to mornings spent meandering side streets and long afternoons at outdoor cafes–in other words, it would be hard to spend too much time in Verona if you’re looking for a quiet Italian getaway! If you have limited time and are hoping to hit the highlights of the city, we’d recommend at least two days to check out the best things to do in Verona. If you only have one day, it’s still definitely worth visiting Verona, but you’ll likely have to cut some stops from your itinerary. 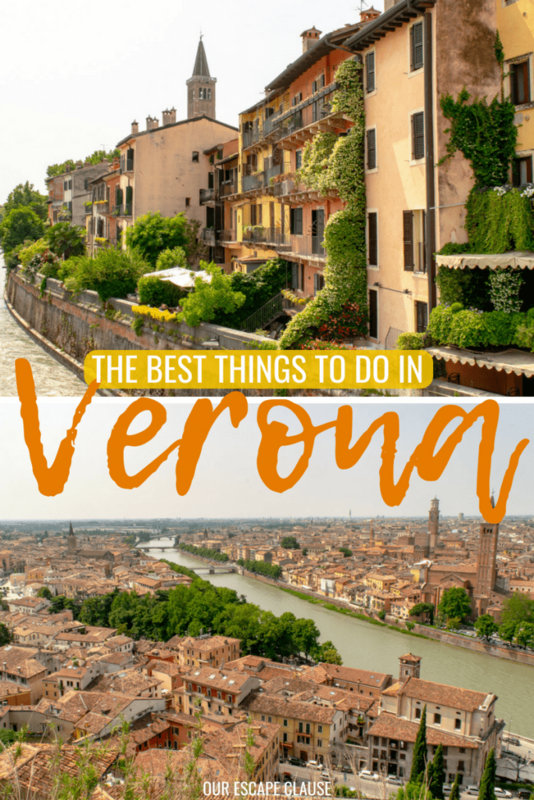 If you have three or more days to spend in the city, start looking at adding some day trips to your list of things to do in Verona! 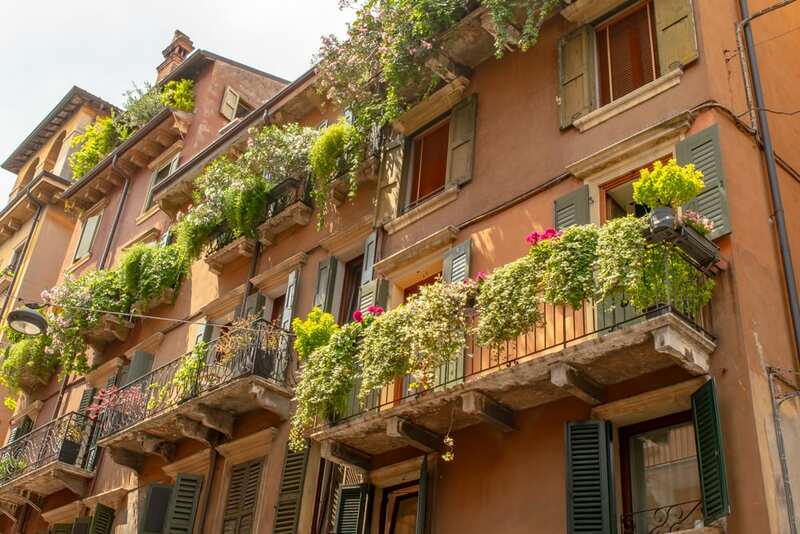 There’s no shortage of great places to stay in Verona–here are a few excellent, well-reviewed and well-located picks to consider. Hotel Gardenia — Hotel Gardenia offers clean and comfortable rooms, a popular included breakfast, good reviews, and a location near a bus stop to reach the center of Verona. The catch? For budget prices, you’ll need to break out that bus pass regularly–Hotel Gardenia (nor most hotels in its price range) are within walking distance of Centro Storico. Check rates & book your stay at Hotel Gardenia! Relais Empire — With a fantastic location just a short walk from Piazza Bra, beautifully decorated rooms, and incredibly good reviews, it’s hard to imagine a better place to stay in Verona on a midrange budget than the Relais Empire! Check rates & book your stay at the Relais Empire! Hotel Milano & Spa — Want to spend your time in Verona in the lap of luxury? Consider a stay at the Hotel Milano, where spa services and a jacuzzi overlooking the Verona Arena are just a few of the amenities. Located in the heart of Verona and boasting near-perfect reviews, you couldn’t ask for a better spot to relax in Verona. Check rates & book your stay at the Hotel Milano & Spa! The Romeo and Juliet tour sounds so interesting! Would love to do that!